There aren't many orange creams out there. 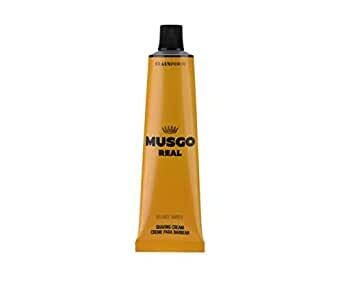 I found this by searching for orange creams and I had heard good things about Musgo Real as a brand. I normally use the English style creams in a tub but I reach for this one frequently. It's a nice subtle spicy orange scent. Very light. Those who think the lather is thin, I have no problem getting thick wonderful yogurt like lather from this. The trick is to use very little water. After soaking my badger brush I squeeze out as much of the water as I can, then put an almond size drop of this cream into my bowl and mix it up a bit. Then I put the brush to my face to continue lathering and I get tons of rich thick creamy lather. More than enough for 4 passes. It requires much less water than typical creams but it can be awesome. If that still doesn't work for you, then try using more product (as they say in the forums). Put a little more cream when you make the lather and see if it helps. I might try their other flavors next. 4.0 out of 5 starsGreat cream. Musgo creams are great. The scents are a little unconventional but they have some performance aspects that are great. If you are used to other creams like the Taylor of Old Bond Street products or Truefitt & Hill these work a little different. Musgo requires a little more water and tends to dry out quicker. Its a little more work to get as much lather as well. However the lanolin in Musgo provides excellent skin conditioning and cushion during the shave. I actually prefer to mix a little Musgo with a TOBS cream with a complimentary scent to get the best of both worlds. For instance the Musgo Orange amber goes great with the TOBS grapefruit. The oak moss mixes well with TOBS sandalwood. The mixture provides a nice smelling comfortable shave. Like I said the Musgo scents are unconventional. Not bad just unconventional. That's less noticeable once it's lathered if you are using it straight and not at all if mixed. I think the lanolin is the unusual smell. Every wet shaver should try Musgo though. It's really good stuff. I'd read about Musgo Real and was anxious to try it. It did NOT disappoint! It lathers up easily, it "slicks" my face nicely for the razor, and the orange amber scent is fantastic! Also, it only takes a small amount. I'd read on Badger & Blade to use an almond sized amount. That was plenty for me to get a good four pass shave. Also, there are a LOT of "almond size amounts" in a tube. Also, about the scent. It is very nice without at all being overbearing. You'll catch a whiff from time-to-time, but it doesn't hang over you. Bottom line: Worth every penny! 5.0 out of 5 starsCosts a bit more, but is worth it. Smells awesome and provides a great shave. Dries out so quickly though, and requires a splash of water here and there, but re-moistening the face in this manner allows for a few pass-overs for cleaning up without having to apply more cream. The smell can only be described as that old-world barbershop scent and although not overpowering, will still be traceable the next day before shaving again. Smells great. The orange is very refreshing. I don't know if it's this scent or just the tube I got, though, but the cream is a little more watery than my tube of classic scent musgo.